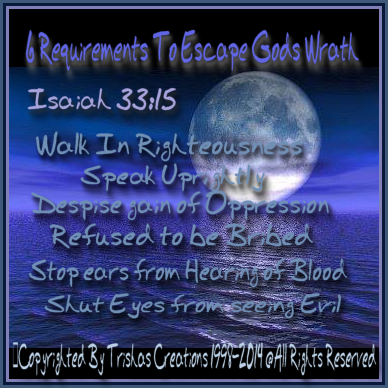 "6 Requirements To Escape God’s Wrath"
Welcome to "6 Requirements To Escape God’s Wrath"
There are so many which honestly think that there is no wrath of God, they simply think that there is never going to be a judgment of what they have done and not asked for forgiveness for. So many people are being deceived into thinking there is no such things as “God’s Wrath” how wrong they are. If, we do NOT repent of our sins, all of us will see what the Wrath of God actually is and what awfulness is coming. Jesus, is our Lord Jesus and we can go to Him anytime and ask Him to forgive us, of our sins, but we have to be sincere. So, many have been deceived by other people or cults, and other people who just cannot believe that God would pour down His wrath on a sinful nation. If, people do NOT REPENT, they will end up being in it and they will not get to Heaven! I have listed 6 Requirements which we all need to follow and do, in order to escape the wrath that this world is going to experience, if people do not repent. Many people all over the world think it’s a joke or just a dream someone came up with, but I kid you NOT if, people refuse to repent they will be in God’s Wrath. Speaking uprightly means to choose words that are honest, true and well ordered, those that are not false, slanderous or obscene.